A few weeks ago, I joined the band of people who work while walking. I type and do almost all my desk work while walking on a treadmill. It has been eye-opening, body changing and inspiring. And unexpected in some ways. Here’s what happened and what it is like. Over the last year, I’ve been reading a lot about the health dangers of being too sedentary and not doing enough exercise. And I am (was) very sedentary. My desk work and my workaholic personality kept me rooted to my chair for hours and hours on end. It didn’t feel good but I couldn’t stop. About a year ago, I bought a Fitbit One, to inspire myself to walk more. Although this helped at first, somewhat, there were two problems for me: 1) I was still a workaholic and still needed/wanted to get a lot of work done so I was still staying at my desk too long and 2) I have an arthritic and cartilage-wrecked knee which has been getting worse and which doesn’t like the manic walking pace that I do, partly in my effort to get the damn walking done as fast as possible and partly because it’s just a Type A personality thing. Walking on roads is painful and walking on hills very. Cycling, too. So, I decided to deal with this sedentariness properly. 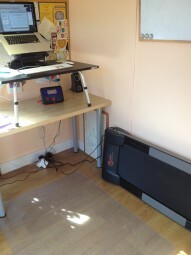 I knew that a friend of mine, Vee Frier, used a treadmill set-up, so I got her advice. I am not sure if I have the same setup but it’s the same principle. I ordered this special desk to go on my desk (was £99.97 but is now £169.99) to make it the height for standing at; and a treadmill (£269.99) especially designed for the purpose, because it’s slim, fits under a desk and goes more slowly than a gym one. And has no incline. The desk arrived first and as soon as I started working at it, I hated it. (Fear not: this has a happy outcome.) It was extremely painful and my knee reacted disastrously. In the nearly three weeks before the treadmill arrived, I thought I’d made an expensive mistake. I was already wondering if I’d be able to send the treadmill and the desk back. The treadmill arrived and I switched it on. Hooray! It didn’t work! Excellent! I could send it back. Then I realised I’d misread the instructions and put the magnetic safety doobry on the wrong bit. As soon as I rectified this, the machine sprang into life. Unfortunately, I was kneeling on it at the time, fiddling with things, and – trust me – this is not a position you want to be in when a treadmill springs into life or anywhere. The second thing I discovered was that it was NOISY. Hooray! A reason to send it back! However, I am not faint-hearted so I duly lugged it up to my garden office, with the help of Mr M (I’m as strong as he is but it’s always good to give him a task). And left it there over the weekend while I dreaded Monday. Monday came and I hobbled up the garden to my fate. on my work. With ideas pouring from my brain and onto the keyboard. I also realised I loved the desk thing, too. It’s quite big and also sturdy. I can have my keyboard, laptop, mouse, notebooks, and COFFEE. Thus began my personal revolution. Three weeks later, my knee is bearing up, I’ve walked between 12k and 20k steps each day (whereas on some previous days I’d be doing fewer than 1k) and I’ve lost 4lbs (which could also be the sugar I’ve given up, though I ate very little of it before). I’ve discovered that 2.5mph is the ideal speed for me while typing and it’s a speed I can walk at without thinking about walking. It’s much slower than my outdoor walking pace, and I think this is why it’s good for my knee – it’s motion without so much flipping force. More to the point, I LOVE walking while working. I’ve always found walking a great way of loosening my creative brain and freeing up ideas but how very much more convenient it is to do that while actually at the screen! It feels very good in every way. It’s very easy to put it on its side out of the way if I actually want to sit down. Btw, can you see the odd thing under the upper desk? With a red button on it? That’s the console, where you adjust the speed and things. And there’s a red cord, which you are supposed to clip to your belt, with a red magnet at the other end, attached to the console. *cough* I erm, don’t… This is so that if you faint and fall off, the treadmill will stop. I have found another advantage: all this walking makes me feel nice and warm so, though I’m using some electricity for the treadmill (500W at the most) I don’t need a heater any more. In fact, I’m working with the door open a lot of the time. Even during a snow storm! You will be so fit! Wow, that is an amazing setup. Not sure I’d be able to manage it, but I do need to do something. I think (check this, though) the treadmill company are happy to take the machine back if it doesn’t work out. Worth seeing if you can test it. I’m so pleased to hear that you’re getting on so well with it, Nicola, I’d wondered if you liked it. I totally forgot to tell you about the noise! I suppose after a while it just sinks into the background and isn’t an issue. Keep walking! Vee, I do apologise – I totally forgot to contact you and thank you! Yes, it’s really been wonderful. And I’m still walking! Really interesting post. I’m very tempted to try, but I’m concerned if I’ll actually be able to type whilst walking! Yup. Shame there isn’t a cheaper alternative, though. 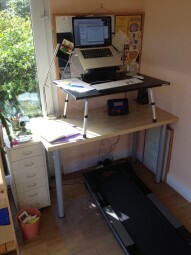 You could improvise the desk part but it’s the walking that makes the difference and makes it comfortable.